The sound of wind rushing, blowing… Hour after hour after hour… Time has no significance… Only wind… heat… One of my first memories, driving through the Mohave desert of Nevada, the car window of our old blue Chevrolet, speeding through the desert, open only a few centimeters. Sand as far as I can see. Rrrrssshhhh..... The constant sound of wind rushing through the car, around me, a moment that lives forever in my soul, almost as if I can close my eyes and be there again, in the desert, in the great expanse of the American West, in those first days of my life, so many decades ago. A fire in the middle of the painted desert, a gas tanker truck in flames higher than I could ever imagine. Blue skies… Palm trees… Sandy beach… Quick birds with long beaks running in the surf. The big, old, long, dark, heavy, magnificent pier, which reaches out into the ocean. Surf Side 6. The most perfect and beautiful blue swimming pool. Laughing, exploring, loving the sea and the birds. A feeling of freedom which is etched in my being. Watching the large pacific waves crashing, I close my eyes. A moment later I re-open them. The waves are still crashing. Yet, in an instant, close to 40 years have passed since those early moments in the desert and by the sea. Mountain becomes desert. Desert becomes sea or a seagull above watching it all. Sometimes I wonder what it would be like to be a mountain. Standing constantly watching and feeling the sea at my feet. Waves crashing, wind blowing, days passing, clouds blowing, rain falling… Time passing… Sun shining… Warmth… Cold… Perhaps my feet would be the cliffs bathing in the sea, the same cliffs we are cycling by today on the edges of the desert… the waves pounding and crashing, wave after wave after wave… Crash… Crash… CRASH… It would never stop… Crash… Sunrise… Sunset… Sunrise… Sunset… There would be such a satisfaction in that stillness of being timeless and watching and being part of these elements, mountain and desert and sea. The last day of my crossing of the Negev desert in Israel, I came to some mountains. Big red mountains. Tall, majestic, still, wonderful, timeless mountains. A feeling of accomplishment of having crossed the desert, by bike, in Palestine, alone. The etchings of Pharaoh Ramses on the cliff walls here, at the base of these mountains, so old. I am amazed to think that the copper miners who came here some 4000 years ago climbed out of the mines before me and saw the same thing I see before me today, the same majestic stark ageless mountains. I left Palestine, Jordan, Saudi Arabia and the Sinai Peninsula of Egypt behind and came to Tenerife, Islas Canarias on my little red bike, crossing Europe from Paris to the South of Spain, out into the islands of the Atlantic. World events that to all these mountains seem so un-necessary, have disturbed so many. Borders closed, the world now afraid of what will happen next. I have not made it back to Greece to pick up my belongings, left at an airport as I boarded ship for the crossing of the Mediterranean to Rhodes, Cyprus and Israel. Instead I find myself with my bike, climbing back and forth across the top of the world in the Canary Islands. Ramses is old now, several thousands of years old. Ageless in a way of his own. Much of known human history has happened since those etchings were made in honour of him on a rock wall at the base of a big mountain in southern Palestine. Surely there have been hundreds of thousands, even millions of sunrises and sunsets since the moments that the mine workers of those days looked upon the same mountains I left behind in the deserts of Palestine. The perspective of the mountains in Tenerife, shadows human history itself, making Ramses, his copper miners and much of world history since then but the wisp of a vapor. I take a break on the top of the Canary Islands’ volcano Tenerife and ponder the massive volcanic “eggs” which rolled partially down the mountainside, huge snowballs of molten lava, that have been sitting here on top of this mountain for sixteen million years. They look out across the ocean, through the clear beautiful sky, beyond the clouds and birds and waves… Is Africa… I wonder… What is it like over there? From here, at the very top of Tenerife, I wonder… What is it like over there, in the desert just beyond those waves, just beyond the edge of the horizon? The Desert, in its great open expanse ahead of us. The sound of wind rushing through my ears. In every direction there is only sand and distance and wind and stillness and beauty. The roads I rode along the Atlantic coast in France seemed to stretch forever, at the time. But here, we have now entered what almost could seem like another dimension. There are no trees to mark the passage of distance. No landmarks to mark the passage of time. No large mountain to mark arrival or departure or progress. No tall bushes. Only a thick heavy haze hangs in the air of the desert, seeming to enclose us in another world. A world of dust and sand and wind. Hour after hour after hour after hour we ride. Day after day after day. The wind which is supposed to push us, has turned against us. The few small bushes and plants become smaller. The few small hills have disappeared and turned into sand. And what remains is only wind and sand. Thick fog encloses us on our first day in the desert. As if we are riding on another planet, alone, the two of us. There is nothing in the universe beyond the twenty meters of sand before us, and then nothingness. I relish moments like these. The mist slowly fades and lifts and the unexpected, small mountains in the desert appear. Low bushes. Camels. And hour after hour after hour of sand and wind and even pain. And we push on. Guelmim, Tan Tan, El Ouatia, Sidi Akhfennir, Tarfaya, Layoune, Lemsid, Boujdour, Echtoucan, Dakhla, Dakmar… And then comes the Mauritanian border, Nouadhibou, Le Park National du Banc D’Arguin, Nouakchott. The desert seems to go on forever. The hundreds of kilometers of heat, haze, sand wind and low bushes have slowly changed over time as we cross week after week pushing deeper into the desert. There are no longer so many bushes, mostly sand and fatigue and wind and dunes. Waking to the sound of honking horns, I remember that we are sleeping in a gas station which is supposed to be open 24 hours per day, somewhere in the middle of the desert of Western Sahara. Well, sort of “all the time open”. Six A.M.. Two cars have pulled up to the pumps and have begun honking their horns. Long and loud and without stopping. I suppose this is the best way to wake the gas station attendants. After at least five minutes of blasting horns, the gentlemen who yesterday were dressed in their “Atlas Station” blue cover-alls now appear in full length beautiful, white with gold trimmed, Islamic robes. Not to serve gas, but to pray. Together they set out one big rug out next to the honking cars by the gasoline pumps, certainly covering several oil spots here and there on the dirty concrete, close to the ever-present piles of sand. And to the sound of those still loudly, continuously honking cars, the attendants kneel and stand in their beautiful garb, on their large rug, facing East to the honking cars, the gasoline pumps and Mecca, praying. This takes some time, a rather loud and surrealistic early morning moment. Soon this is over, clothes are changed back to “blue atlas” cover-alls, the cars are tanked full. Once again, peace and quiet descend upon our sleeping spot, a half-dirty, half-clean room in a gas station, somewhere in the middle of the Sahara desert, between nowhere and nowhere else. Of course, an hour later, no amount of pounding and rattling can wake the attendants again for a few liters of water. Finally awake, they look at us as if we are crazy for needing water at this apparently ungodly hour of the morning. As if gasoline was more important than water? There is a solemn feeling in being lost in the desert, hundreds of kilometers of road before us, hundreds behind. Perhaps as I look left it may even be thousands of kilometers to the next village or encampment. Before us at least 160 kilometers of open road to the next known human habitation, as we leave the gas station behind where we slept for the night. Not a village, not a house in between. Only land mines along the road, keeping us always very close to the pavement. This brings a feeling of freedom. The true adventure of heading out into the unknown, to fight against the elements and against fatigue . To fight against wind and sand. But what started as a surprisingly still early morning start, soon becomes a strong head wind, which we have been so used to. Becomes blowing sand. Stronger and stronger and stronger the wind blows. Our start was simply the calm before the storm. Soon I must lean my bicycle hard into the wind in order to not be completely blown over. The sky darkens with sand. What started off as adventure has changed into a fight for survival. The wind is gusting and it is close to impossible to keep from being blown over. We are fighting a full fledged sand storm with winds of 100 to 130 kilometers per hour. The road disappears under the blowing sand. It is impossible to go on and impossible to stay put. The land mines here are only a few meters from the road. Even were we to try, surely our tent would be ripped to shreds if we attempted setting it up in such a storm. Almost beyond reason, we move on, slowly forward against the elements. I can fight wind and sand and storm. I can climb mountains, brave cold and withstand heat in the most treacherous of climates. Harder though than any kilometer in the heat of the desert, harder than the steepest climb of any of the most difficult mountain passes in Switzerland, France, Italy or Spain or than any kilometer in the desert, harder than the most difficult road one can ever imagine, the hardest kilometers I ride in the desert, are those which must be left behind. It is impossible to move on. This has turned from adventure to pure danger and a life threatening situation. It is simply impossible to win against a full fledged Saharan sand storm. How can we move forward when sand hides the road, mines keep us from stopping, sand blasts us, wind pushes us so so hard. Thumbs out we have found a very small truck already full with several Saharaouine men, in which we load the bikes all of our baggage myself, a Bedouin a whole load of other baggage. Chantal rides in the front. They are on their way to buy a camel in the desert. The most difficult kilometers of the desert are those that I now see, kilometer after kilometer, flying by, filled with sadness that it must be so. But this way we stay alive. My wife is sitting piled in the front of the truck with several other Bedouins. I really don’t want or need two more Saharaouine wives, I would much rather continue our bicycle trek with my own wife. The Sahara desert has shown us it’s true power and strength. The land mines we are so careful about are but small compared to the desert when it chooses to bare its real teeth. No man or woman can fight against such power. We must make radical decisions in order to survive when the desert displays its true force. We have done this and survive another day. The storm dies down, the sun comes back out and we continue our trek across the desert in the way which I truly find best, by our own will power and leg power. It takes time… Time to heal disappointment and pain. Somehow, I discover that the desert is big enough to contain us and all the adventure. The next day, our last in The Western Sahara and what some would consider Morocco, is another day of physical pain and punishment. 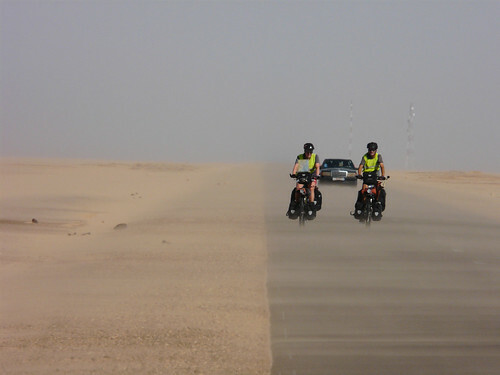 A day of pushing hour after hour after hour after hour into strong headwinds to make it to the border with Mauritania. The haze, which has been with us for so many days now, seems to thicken with the ever increasing heat. As if somehow, the desert would show us that in spite of having out-smarted it for a moment, it is still real and alive. Heat and sweat and wind and sand, all, always ever present. We move forward, meter after meter, turn after turn, each time hoping to somehow cut into the ever so strong headwind at perhaps a slightly better advantage. In the end though, no matter which direction we turn, the wind is ever present. The blowing sand is ever-present. And all we can do is continue pedaling forward, moment after moment. Sweat and heat and sand and wind. Almost as if we were forced into some sort of meditative state as we look forward through the heat to the dunes and small hills which are with us today. We have lost track of time. Only the sun and the distance are present in our lives anymore. Huge unusual white dunes rise up out of the desert and hills, shimmering in the heat. Quiet. Still. Only the sound of blowing wind. And then a white albino camel appears out of nowhere before us, standing in the sand on the edges of the road, silhouetted before the white dune behind, a pack strapped to its back. Other camels come to join him. For a moment we see the Bedouin herder and in a flash he is gone and moments later we see him far away, chasing after the other camels of his herd. Almost as if for an instant, Lawrence of Arabia had joined us, and then disappeared. The heat and stillness all make this seem surreal. We step back on the bikes after our moment of watching and move on, through the dunes and hills. The road worker we join for tea, served on a road sign on the side of the road, whose job it is to remove sand from the road, remind us of the real danger of the mines. There is so much sand on the road, we wonder how at the task of such a small crew in such a big desert working on such a long road, alone. A camel was blown up here three days ago. He stepped on a mine. On to Mauritania, to Nouahdhibou, to Nouakchott. It seems we have entered the real Africa now. Arabia has been left behind. The Islam here is more strict. The desert more varied and more beautiful than before. And we bike on, on through the dunes and sand. And somehow, it seems we have made it far enough. Far enough to cross through and over the last dunes and stretches of sand of the desert. And somehow after so many many many hours and days and weeks we have made it across the Sahara. The Sahara Desert has made its mark on us. How many days will it take to wash the sand from every pore of our bodies? There is no way one can comprehend what you have been through in the dessert. So glad you are beyond that now. I know the experience was unforgettable but a little close to the edge of everything. Your detailed descriptions make me feel like we have traveled with you through the wind and sand and heat. We could not have imagined when we first crossed the Mohave Desert with you that the sand and wind from then would be remembered as you rejoin wind and sand now. I love reading your reflections.